A new NASA study published just yesterday confirms long-held warnings about rising oceans from IPCC and other climate change watch dog bodies. What it found, looking back over the last 25 years, was not only that seas were rising, but that they were rising at an ever-increasing annual rate. If we took a snap shot of the present day, we’d find that oceans are rising at a rate of around 3.3 mm per year. If that rate were to hold steady, it would translate to a 33 centimeter rise per century. Or about 1.1 feet. This is global average rise, of course. In more vulnerable places like Tidewater, VA, or New Orleans, or Miami, such a larger swelling of the world’s ocean could translate to 2-3 feet due to local conditions like subsidence or ocean current change. That’s bad enough. But it’s not the whole story. According to NASA, that annual rate of sea level rise is also rising. In other words, it’s accelerating like a car when you slowly but inexorably increase pressure on the peddle. The present annual increase measured by NASA’s satellites shows a 0.08 mm rate of acceleration averaged over the past 25 years. What this means is that if the rate of increase remains steady, next year seas will rise by 3.38 mm, and the following year seas will rise by 3.46 mm. Extrapolate that to the end of this Century and you’d get an annual rate of rise of around 10 mm per year — or about 3.3 feet every 100 years. This translates to roughly 26 inches of additional sea level rise from now to 2100 globally — or about 3-5 feet in more locally vulnerable places like Tidewater, New Orleans, and Miami. Of course, given the fact that we continue to burn fossil fuels, that the necessary renewable energy transition continues to be delayed by predatory industries and their proxy politicians (primarily republicans like Trump in the United States), there is no guarantee that the rate of annual increase in sea level won’t accelerate faster than it already is. So, for this reason, the new NASA, IPCC-confirming, report should be viewed under a caveat (Dr Eric Rignot points toward sea level rise of greater than 1 meter by 2100). In other words, if we don’t respond soon, the glaciers in Greenland and Antarctica that are already speeding the rate of global sea level rise could start to really let loose and get us into even more trouble than we already are. Greenland — a region vulnerable to the slings and arrows of human-forced climate change — appears set to experience both considerable warming and a significant melt spike this week. Starting on Wednesday, May 3, a sprawling dome of high pressure is expected to begin to extend westward from the far North Atlantic and out over Iceland. As the high pressure dome builds to 1040 mb over the next couple of days, its clockwise flow will thrust abnormally warm and moist air northward out of the Atlantic. This air-mass is expected first to over-ride eastern Greenland, then run up into Baffin Bay, finally encompassing most of the island and its vast, receding glaciers. Liquid precipitation is then expected to start falling over southern sections of the Greenland Ice Sheet as temperatures rise to 1-6 C (33 to 43 F) or warmer. Since water contains more latent heat energy than air, such rainfall is likely to produce more melt than would otherwise be caused by a simple temperature rise. For those of us living in more southerly climes, a temperature of 6 C (43 F) may not sound very warm. But for the northeastern region of Greenland shared by the Zachariae, Brittania, Freja, and Violin Glaciers, such temperatures far exceed ordinary expectations for early May. They are anything but normal. In fact, the building influx of heat is more reminiscent to readings Greenland would have tended to experience during summer — if at all — under past climate averages. Unfortunately, the new climate presented by human-forced warming is now capable of producing some rather extraordinary temperature extremes. And the anomaly ranges that are predicted for the coming week are nothing short of outlandish. According to climate reanalysis data, by May 5th, temperatures over northern and eastern Greenland are expected to range between 15 C above average over a wide region and between 20 and 28 C above average in the northeast. For the Fahrenheit-minded, that’s 27 to 50 degrees F above normal. Or the equivalent of a 102 F to 125 F May day high in Gaithersburg, MD. Overall excessions for Greenland temperature are also predicted to be quite extraordinary for the day — hitting nearly 9 degrees Celsius (16 F) above average for the whole of this large island. So much warmth extending so far inland and combining with liquid precipitation, if it emerges as predicted in these GFS climate models, is likely to produce a significant early season melt spike — especially over southern and eastern Greenland. In places, these temperatures exceed expected normal summer conditions for Greenland’s glaciers. So it is difficult to imagine a situation where a significant surface melt spike does not occur if these predicted temperatures emerge. With each passing year, the effects of human-caused climate change become more and more visible. But for some reason, Halloween appears to be a preferred time for the emergence of various hothouse hobgoblins. In 2012, the Atlantic seaboard was reeling after a vicious strike from Hurricane Sandy. Over the past three years, powerful North Atlantic storms had begun to build at this time of year, setting sights on the UK and Europe. This year, as a hurricane-force low roars toward the Aleutians, the nastiness comes in the form of weird heatwaves, record-low global sea ice coverage, and hints of odd late-fall Greenland melt. Record Heat Strikes Arctic, U.S. Yesterday, those temperatures exceeded the 6-C-above-normal mark. And later this week, temperatures for the region could approach 6.3 to 6.5 C above average. These are the average departure ranges for the entire area above the Arctic Circle. Localities within that broader region are hitting as much as 20 C (36 Fahrenheit) or more above average on an almost daily basis, bringing temperatures more typical of the Arctic during late summer than in the middle of fall. In Barrow, Alaska, Jonathan Erdman reports that Saturday saw the proverbial mercury hit 41 F. This temperature, at about 26 degrees above average, smashed the previous daily high and pushed the latest day Barrow has ever seen a reading above 40 F fully one week forward. Farther south, the lower 48 is experiencing what Bob Henson over at Weather Underground is calling the Halloween Heatwave. Over the past week alone, nearly 300 daytime high marks were broken. But the measure of record-high minimum temperatures — a key indicator of human-forced warming — is off the charts with 639 total records smashed over the past seven days. Even more noteworthy than the degree of warmth is the lack of widespread autumn chill. For example, Minneapolis has yet to dip below 36°F as of Friday, October 28. That doesn’t look likely to happen before at least next weekend (November 5 – 6). In records going back to 1873, the latest Minneapolis has ever gone before seeing its first 35°F of the autumn is November 1, way back in 1931. The city’s latest first freeze was on Nov. 7, 1900. Reinforcing this point, NOAA finds that over the past week just 40 record low high temperatures were achieved (about one-seventh the number of record highs). Meanwhile, record low nighttime temperatures were only achieved in six instances, about one-one-hundredth the rate of record high minimum temperatures! Furthermore, at no location in the U.S. for this week, this month, or even this past year has snow depth achieved a new record high. That’s a pretty ridiculous indicator that the U.S. has reached a rather disturbing climate threshold for heat overall. Even as new warm temperature records were being set with amazing frequency across parts of the Northern Hemisphere, another duo of worrisome indicators were popping up in the Arctic and Antarctic. 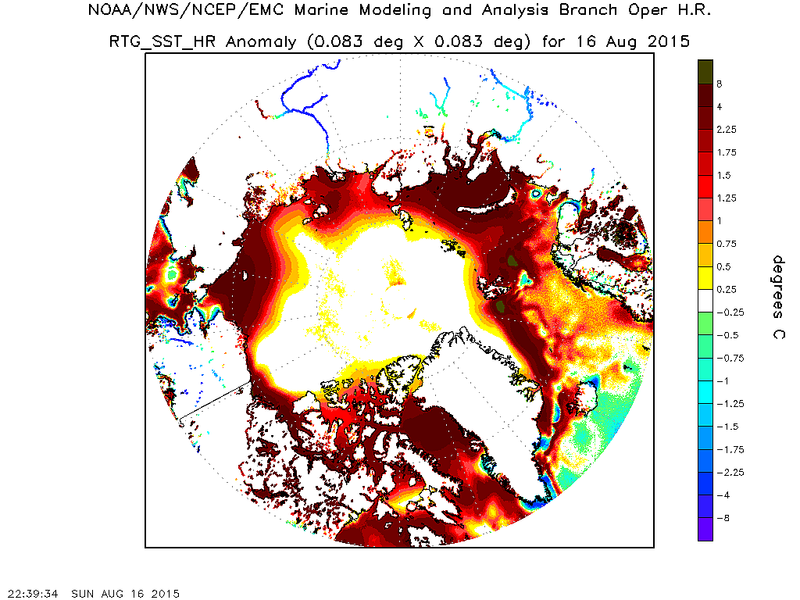 In the Arctic, the ocean has been loaded up with a ridiculous amount of heat. This heat is preventing the ocean from refreezing, creating various regional barriers to ice formation as the waters ventilate this excess heat into the atmosphere. As a result, Arctic sea-ice extent record lows continue to deepen. Fall 2016 sea ice extent values — which have consistently lagged behind average daily refreeze rates for most of the season — are now more than 600,000 square kilometers below the previous record set during 2012. It’s, quite frankly, an insane shattering of the previous record low value; a warming-spurred melt that has erased an area of sea ice coverage nearly the size of Texas in just four years. The Washington Post this past Friday provided a good article explaining the dynamics involved and highlighted predictions by prominent Arctic researchers that ice-free summers could occur by the 2030s. This is a marked departure from earlier estimates that had put off ice-free summers until the 2050s or even the 2080s. However, it’s worth noting that there’s a decent risk that even these more advanced predictions may prove conservative in the end. Under current trends, ice-free periods for the Arctic Ocean during summer become statistically possible as soon as the early to mid 2020s, and a strong outlier year — where an abnormally warm winter is followed by an abnormally warm summer — could produce such a result even sooner. On the other side of the world, the Antarctic is also experiencing record-low ranges for sea ice extents. There, regional temperatures are near 4 C above average for the entire Antarctic. Though these departures are not as extreme as those currently seen in the Arctic, they are certainly enough to impact sea ice. Now, sea ice extent values there are at their second lowest ever recorded in the daily measure. Over recent years, storminess in the Southern Ocean and an expanding fresh water lens running out from Antarctica due to glacial melt have generated a seemingly contradictory expansion of sea ice near Antarctica. This happens because fresh water at the ocean’s surface acts to deflect heat toward the ocean bottom, a feature that has enabled the melting of various glacier undersides in Antarctica. But as the global ocean and atmosphere warm in general, larger melt outflows are necessary to reinforce this surface freshwater lens effect. As a result, we appear to be experiencing a seesaw in Antarctic sea ice extent as a pulse of atmospheric and ocean warming overrides the impact of initial fresh water lensing. The combination of significant sea ice losses in the north and second-lowest sea ice extents in the south has resulted in a global sea-ice measure that is well below anything seen in the past for this time of year. It is also one of the largest global negative sea-ice departures seen for any part of the record for any time of year — even when compared to the extreme period of Arctic sea ice loss during September of 2012. In addition to producing heatwaves, new temperature records, and ever more extreme sea ice melt, the odd Halloween warmth appears to also be generating flashes of surface melt over parts of northeastern Greenland. There, over the past few days, temperatures have approached or even exceeded the freezing point as warm winds have blown in from the heating Greenland Strait. This heat has been enough to trip NSIDC’s Greenland melt indicators for the region of the Zachariæ Isstrøm glacier. These indicators, over the past couple of days, have shown relatively extensive melt in this sector of Greenland. During summer 2016, northeastern Greenland was one of the regions that saw strongest indications of surface melt. Typically isolated by sea ice from warm ocean breezes, northeast Greenland does not usually see such long-lasting periods of surface melt. This is especially true for late October as melt during this time for any portion of the Greenland Ice Sheet is practically unheard of. However, as warm ocean water has advanced further and further north, this region has become more vulnerable to invasions of warm air. And it appears that the melt-forcing effect of this ocean warming for nearby Greenland glaciers may well be extending into fall. Though unconfirmed by NSIDC, these periods of possible melt have occurred coincident with temperature departures in the range of 10-20 degrees C above average. However, since near or above freezing temperatures have mostly been isolated to the very far northeastern sections of Zachariæ Isstrøm near the coast, it’s likely that any potential and brief periods of melt were located in a more limited band than what has shown up on the NSIDC melt maps for October 27, 28, and 29. That said, as noted above, any surface melt over glaicers in Greenland for this time of year would be very odd and concerning — no matter how isolated. Halloween heatwaves, record-low sea ice extents and possible periods of fall Greenland melt are all indicators that human-forced climate change is starting to generate more and more obvious effects. Though the most extreme impacts are hitting remote regions like Greenland, the Arctic and the Antarctic, the related abnormal warmth has filtered into the middle latitudes and is now affecting millions of people across the U.S. And what’s happening in the U.S. is linked to these related warming events on a global scale. So happy Halloween, everyone. Enjoy the holiday. But remember that if it’s oddly warm where you are, it’s not just a freak warm weather treat, but one of the many and worsening tricks conjured up by global climate change. During recent years, as human fossil-fuel emissions have forced the Earth to warm, observations of Greenland’s surface has indicated a rising rate of melt. What has been less well-observed is melt rates beneath the ice and near the ice base. This is important because the pooling of water beneath the great ice sheet can help speed its movement toward ocean outlets, along with accumulating heat at the base of the ice — which can also quicken the pace of overall melt. This mapping study found that wide expanses of northern Greenland and pretty much all of southern Greenland are now experiencing melt at the ice sheet base. As the interior of Greenland has a cracked-bowl topography — with land bowing down into a central trough and numerous furrows connecting the ice sheet with the ocean — understanding where liquid water and heat are pooling at the bottom of the ice sheet will help scientists to get a better idea of how Greenland’s glaciers will respond to human-forced warming. Melt along the base of the Greenland ice sheet has long been influenced by heat welling up from or trapped near the Earth’s surface. The heavy, thick ice sheet densely packs the ground and rocks under it, which generates and amplifies geothermal hot-spots beneath Greenland. In addition, the ice creates a kind of insulating layer which locks that ground heat in. As a result, the bottom of the ice sheet is often tens of degrees warmer than its top. Alone, this blanketing effect is enough to generate some melt along the bottom of Greenland. But now that the surface is melting more and more, heat transport from the ice surface to the bottom via liquid water funneling down to pool below is a more common occurrence. The way this heat transfer works is that rising temperatures over Greenland form more extensive surface lakes and melt ponds during the increasingly warm summers (and sometimes briefly during other periods). Often, the meltwater will find a crack in the ice and flow down to the ice interior. Sometimes the water remains suspended in the middle layers between the surface and the ice sheet base as a kind of heat bubble. At other times, the water will bore all the way down to the ground where it can form into pools or subglacial lakes. At Flade Isblink in northeastern Greenland, such a filling of a subglacial lake was observed during the 2011 and 2012 melt years. As Greenland warms, such instances are likely to become more common. In this way, melt at the surface can add to the amount of heat trapped below the ice sheet — forming a kind of synergistic melt process. The new NASA study helps our understanding of how such a process might unfold by showing the current extent of subsurface melt. The study combined physical models with observations to create this larger picture of bottom melt, telling a dramatic story of the opening period of human-forced Greenland melt, in which sub-surface melt is already very extensive. In context, the Greenland ice sheet is the largest repository of land ice remaining in the Northern Hemisphere. Covering a vast region of 1,710,000 square kilometers and rising up to 3 kilometers high at its tallest point, this ice sheet contains fully 2,850,000 cubic kilometers of ice. If all this ice melted, it would raise the world’s sea levels by around 7.2 meters (nearly 24 feet). This enormous mountain of ice astride Greenland began to form about 11 to 18 million years ago during the Middle Miocene climate epoch. Back then, atmospheric carbon dioxide ranged from 405 to 500 parts per million. This decline from earlier, higher CO2 concentrations was allowing the world to cool enough to begin to support glacial ice in this region (around 4 C warmer than 1880s values). Back then, Greenland’s ice was far smaller, far less extensive. It was a baby ice sheet that would grow into a behemoth as the Miocene cooled into the Pliocene — when CO2 levels fell to around 390 to 405 ppm — and then into the various ice ages and interglacials that followed (featuring atmospheric CO2 in the range of around 180 ppm during ice ages and around 275 ppm during interglacials). Now, human fossil-fuel burning has put the ice sheet in a great global-warming time machine. With atmospheric CO2 levels hitting Middle Miocene ranges of 407.5 ppm at Mauna Loa this year, an accumulation of enough heat to significantly melt large portions of Greenland’s ice is a very real and growing concern. Exactly how that melt may unfold is still a big scientific mystery, but the risks are growing along with the heat and the new NASA basal melt study helps to shed a little light. Over the past couple of days, temperatures across the Greenland Ice Sheet have really ramped up. The result has been a pretty significant mid-to-late season melt pulse. According to NSIDC, nearly 40 percent of the ice sheet surface has been affected by surface melt during recent days. And Greenland ice mass balance appears to have also taken a hit. On July 20th, this approximate 300 x 70 mile swath of Western Greenland shows a number of distinct strong melt features. Near the interior edge of the melt zone we notice the light blue coloration indicative of widespread and general surface melt. From the satellite, this bluing gives the impression of a thin layer of surface water covering a widespread area of the ice sheet. But it is more likely that the blue tint comes from a plethora of small melt ponds and rivers that blend together in the lower resolution satellite shot to lend the impression of ubiquitous water coverage. Further in, we notice the darker blue swatches that indicate large melt ponds. Some of these ponds are quite extensive — measuring 1/4 to up to 1 mile in length. Ponds of this size tend to put a lot of pressure on the Greenland surface and can pretty quickly bore down into the ice sheet’s depths and interior. The water then either becomes locked in the ice — forming a kind of subglacial lake — or flows to base regions of the glacier where it can lubricate the ice — causing it to speed up. Still closer to the ice edge we find greatly darkened patches of ice. Darkening occurs when ice melt reveals and thickens past layers of ice sheet dust and soot accumulation. Each year, winds carry dust from land masses and soot from fires — which now, due to rapid Earth warming, burn more frequently over the Arctic and near-Arctic — to the ice sheet where it accumulates. This darker material is then covered by the annual layers of snowfall. If enough snow and ice melts, the yearly layers of dust and soot accumulation can concentrate into a gray-black covering. Such a covering is clearly visible in the July 20 satellite imagery above. According to Dr. Jason Box, as much as 5.6 percent of the Greenland Ice Sheet was covered by this darkening, which he calls Dark Snow, as recently as 2014. Darkening of the Greenland ice sheet can accelerate melt as it reduces the ice sheet’s ability to reflect the sun’s rays — resulting in more overall heat absorption. Though surface melt and darkening is quite extensive along the southwestern flank of Greenland, toward the north and east, widespread surface melt, ponding and ice darkening is also visible over sections of the Zachariae Glacier. Here, in a far northern section of Greenland that borders the Arctic Ocean, we find an approximate 100 x 20 mile region of melting and darkening ice. 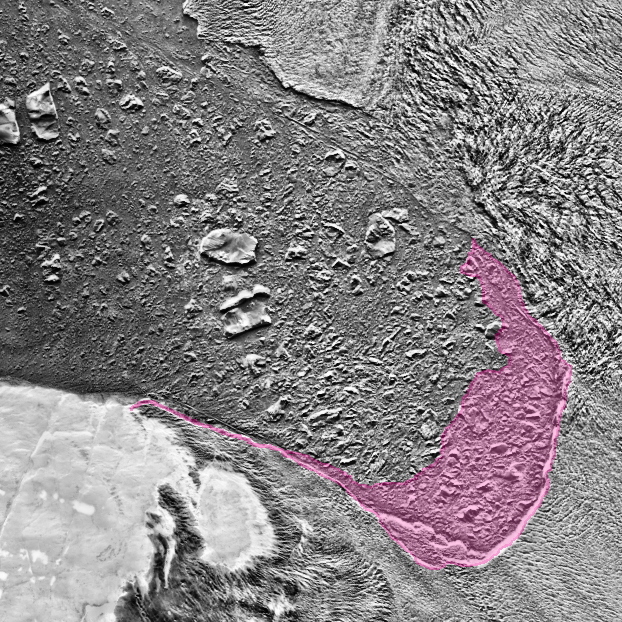 Note the tell-tale bluing and dark gray patches visible in the above image. For this region, ice has tended to experience more melt during recent years as sea ice within the Fram Strait and Greenland Sea has receded. This has revealed more darker ocean surfaces which, in turn, has absorbed more incoming solar radiation resulting in increased warming for this section of Greenland. 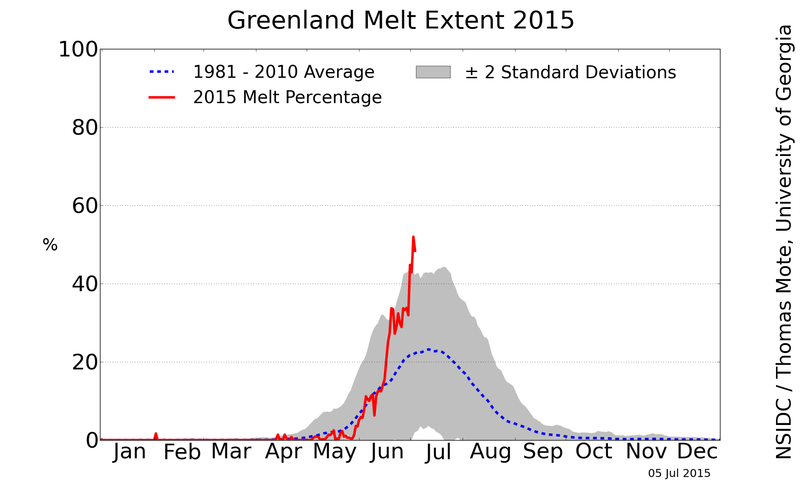 Overall, Greenland melt is this year less extensive than the record 2012 melt season. However, the current mid-to-late season pulse has forced a big melt acceleration that may result in melt that exceeds 250 billion tons of ice loss for 2016 (or the average over recent years). In the pretty near future, continued high global temperatures and additional warming due to human fossil fuel emissions will almost certainly push Greenland to melt at a faster pace. To this point, the Earth has now warmed by more than 1 C above Preindustrial temperatures. And a range of 1-2 C warming from this baseline in past climate eras such as the Eemian resulted in a 10-20 foot rise in world ocean levels. We’re in this temperature range now. So that’s pretty bad news for sea level rise — to which Greenland now contributes enough melt to lift seas by about 0.75 mm every year. The only real questions at this point are how fast will that already substantial melt accelerate, and will we halt fossil fuel burning swiftly enough to slow it down. According to a new report, the Greenland Ice Sheet lost one trillion tons of water due to melt during the four-year period from 2011 through 2014. That’s about double the typical rate of loss during the 1990s through mid-2000s. Subsequently, Greenland’s contribution to sea-level rise also doubled. As a result, Greenland alone contributed 0.75 mm of sea-level rise every year during the 2011 to 2014 period. Bear in mind, the study focuses on Greenland only. Those numbers don’t include thermal expansion from the world’s warming oceans. Nor do they include an increasing amount of melt from Antarctica. Nor do they include large volumes of melt coming from the world’s rapidly disappearing mountain glaciers. Together, all of these in total are pushing sea levels higher by around 4 mm per year during the 2011 through 2016 period. That’s about 1 mm more per year than the 1993 to 2009 period. But the greater additional contribution appears to be coming from melting glaciers in Greenland and Antarctica. The new Greenland Study found that melt averaged around 250 billion tons per year over the four-year period. This included a single melt year, 2012, in which Greenland contributed about half a trillion tons of melt water. The massive 2012 melt was spurred by high Greenland surface temperatures during summer which resulted in spiking surface melt rates during June, July, and August. At the time, a powerful high pressure system focused heat across the ice sheet which caused most of the surface area of Greenland’s glaciers to experience melt. During 2011–2014, Greenland mass loss averaged 269 ± 51 Gt/yr. Atmospherically driven losses were widespread, with surface melt variability driving large fluctuations in the annual mass deficit. Terminus regions of five dynamically thinning glaciers, which constitute less than 1% of Greenland’s area, contributed more than 12% of the net ice loss. This high-resolution record demonstrates that mass deficits extending over small spatial and temporal scales have made a relatively large contribution to recent ice sheet imbalance. In other words, melt at the margins of the ice sheet and large surface melt pulses during brief periods were the primary contributors to increasing melt rated during the study period. The study found that surface melt rates were highly variable and dependent upon weather — with a strongly negative North Atlantic Oscillation contributing to conditions that enhanced melt during 2012. In this case, it appears that natural variability is beginning to be pushed by human-forced warming into a phase where certain years will preferentially further enhance Greenland melt. To this point, the tendency for large surface melt spikes was found to have increased during recent years. In contrast to Antarctica, where warming oceans contact glacial cliff faces and ice shelf undersides to accelerate melt, in Greenland, surface melt appears to currently be playing a bigger role in driving melt acceleration. Surface melt can produce odd and unstable patterns of melt ponding and runoff over large ice sheets like Greenland. And as Greenland continues to warm due to human-forced climate change, an increasing risk of glacial outburst floods can be the result. The highly variable nature of surface melt is also a concern. In other words, overall warming can produce extreme, if brief, periods of warmth over Greenland that produce disproportionately large melt spikes. In this case, 2012 should not be seen as an outlier, but as the first of many future strong surface melt years — ones that will almost certainly surpass that year in melt intensity unless human-forced warming is somehow brought to a halt. Civitas — the latin word for city and the root word for civilization. Civilization, in other words, is a collection of component cities. And, by extension, any major threat to a large number of cities is a threat to civilization itself. Such is the case with human-forced climate change. It’s a sad fact that many of the hundreds of coastal cities around the world are living on borrowed time. Current greenhouse gas levels — topping out near 408 parts per million CO2 (and 490 parts per million CO2e) this year — will need to fall in order to prevent 1-3 C of additional warming and 25 to 60 feet or more of sea level rise over the coming decades and centuries. And even if we somehow dialed atmospheric CO2 and CO2e levels back to 350 ppm, it’s likely that we’d still see seas eventually rise by 10-20 feet over the long term due to already destabilized glaciers in places like Greenland or West Antarctica. But with fossil fuel burning continuing at near record levels globally, and with many corporations and political bodies around the world dragging feet on greenhouse gas emissions cuts, the level of heat-trapping carbon held aloft in our airs will continue to rise for some time. These vastly irresponsible actions will further heat the atmosphere and ocean — melting a greater share of the world’s land ice and forcing seas to ultimately rise even more. If CO2e exceeds a range of 550 to 650 parts per million — which could easily happen even under so-called moderate rates of fossil fuel burning before the middle of the 21st Century — then all the land ice on Earth will be placed under melt pressure. And that vast sum of ice melt represents about 220 feet of sea level rise long term so long as the greenhouse gas melt and heat pressure remains. Even more disturbing is the fact that in the geological past, glacial melt has not tended to process in a gradual, orderly fashion. Instead, initial gradual melt has, in deep history, often been punctuated by very large melt pulses as glacial systems rapidly succumbed to warming environments. And with human warming now proceeding at a pace about 20 times faster than the end of the last ice age, the risk for rapid melt has been greatly enhanced. Despite continued snide claims by climate change deniers to the contrary — it really is a global emergency. One that includes difficult impacts now and a rising risk of far worse impacts to come. A very real kind of long emergency for human civilization and the natural world combined. One made no less worse by its current deceptively slow, if massive and inexorable, advance. Due to this threat posed by human-forced warming of the global climate system, cities that have lasted for hundreds or thousands of years now face a serious risk that they will ultimately be devoured by rising tides. Around the world, nearly half of the world’s approximate 4,000 cities with populations of greater than 100,000 people sit on or near the coastline, at elevations below 220 feet, or near bodies of water that are vulnerable to sea level rise. Under the continued pressure of human-forced warming on global ocean levels, a good number (5-10 percent) of these cities may begin to succumb to rising tides in as little as a 10-30 years. And, long term, over 30-300 year time frames, pretty much all are threatened if the world continues burning fossil fuels. New Orleans, London, Sydney, Shanghai, Los Angeles, New York, Alexandria, Amsterdam, Miami, Norfolk, Washington DC, and Toyko are just a handful of the major cities that are mostly low-lying or that contain large low-lying sections. And all are below the 220 foot sea level rise line that current levels of fossil fuel burning will begin to put into long-term play before mid-Century. While complete inundation by rising tides is the ultimate issue, cities do not have to face such drowning to fall under threat. Water supplies, transportation nodes and arteries, food supplies, and energy production and distribution facilities all represent lynch-pins that, if disrupted, can take down a city’s ability to effectively function. And sea level rise often threatens many or all of these critical supports well before the problem of total inundation becomes an issue. Miami, for example, now faces a combination of these threats due to the presently emerging early outlier effects of human-forced sea level rise. There, just one foot of rising tides since the early 1870s has now put 2.4 million of Miami’s residents and 1.3 million homes within 4 feet of the high tide mark. By 2015, that relatively minor sea level rise had increased tidal flooding by 50 percent. Roadways and neighborhoods were more frequently cut off by the rising waters — which prompted the election of Philip Levine as Mayor of Miami Beach and the implementation of his 400 million dollar project to elevate roads and add pumps. The city’s water supply, provided by a fresh water aquifer running through porous limestone, is protected from ocean salt water intrusion by a fresh water barrier of canals. A mere six additional inches of sea level rise will render the current system both ineffective and vulnerable to over-topping due to heavy rainfall events. By 2030, Miami is expected to see between 6-10 more inches of sea level rise. By the end of this Century, it will probably see at least 6 feet — and that’s if we don’t pursue business as usual fossil fuel burning and if the world’s glaciers mostly behave themselves by not giving us a big, angry melt pulse in response to our insults. The result is that not only Miami, but the far-flung critical infrastructure that supports it is also under threat. In this context, Miami’s airport is just 8 feet above the high tide line. The nearby Turkey Point Nuclear facility which provides energy to the city and a big chunk of South Florida is about 6 feet above the high tide line. And though its reactors are elevated by another 20 feet of concrete buttressing, this Century’s predicted sea level rise would flood its grounds and surrounding roadways — likely rendering it inoperable. In the US, nine nuclear power stations are located on the coast. Another 13 are vulnerable to sea level rise. These sites are located near the ocean or along ocean fed rivers. They are ultimately vulnerable to sea level rise spurred by 2 or 4 degrees Celsius worth of warming. Without a herculean effort to not only reduce greenhouse gasses, but to recapture them from the atmosphere, 2 C warming is already locked in (this Century or longer term). The 4 C number is possible by late this Century under business as usual fossil fuel burning and is possible long term (500 year time scales) under the continuous 490 ppm CO2e forcing now in place. Many large coal and gas power plants which also require heavy flows of water to support their operations are located near the coast. Oil refineries, which rely on shipping are often very close to sea level. Many major roadways are vulnerable to cut-off from sea level rise. And an amazingly large number of key airports are below a 20 foot elevation. A small sampling includes San Diego International Airport at 13ft in elevation, Santa Barbara — 10 feet, Vancouver –14 feet, Portland 20 feet, JFK — 13 feet, La Guardia — runway elevations between 7 and 21 feet, Reagan National — 13 feet. In the northeastern US, another city has recently had a harsh global warming wake-up call. About a foot of east coast sea level rise added to the approximate 13 foot storm surge of Hurricane Sandy to flood Staten Island and large sections of lower Manhattan. The local power station flooded — propelling the city into darkness even as the subway system drowned and one neighborhood filled with water and burned at the same time. Post Sandy responses have resulted in a flurry of activity. Fully 60 billion dollars has been spent to rebuild and a good chunk of that has gone to making the city more protected against both storms and rising sea levels. High rises are now required to lift critical infrastructure such as water pumps and spare generators into the upper stories should lower levels flood. A big flood resiliency effort, starting with the 3 billion dollar construction of a 10 foot high, two mile long flood barrier in 2017, is underway. One that may buttress much of lower Manhattan behind a U shaped wall meant to deflect both rising tides and worsening storms. And a new park now features hills up to 70 feet above sea level. These efforts appear to be aimed at facing off against another 1 foot of sea level rise for Manhattan by 2030 and a North Atlantic Ocean that is increasingly riled by powerful storms due to warming related climate instabilities. New York is digging in for the fight of its life. And for good reason. 10 percent of US gross domestic product funnels through this city of 8.5 million and over 100 billion dollars worth of real estate now sits in a high risk flood zone. But build and buttress as it might, New York is hopeless in the long term if we can’t somehow stop human carbon emissions soon. If we can’t somehow start to draw carbon out of the air. If we can’t do these things, then New York, Miami and thousands of other coastal cities will ultimately face 25 feet of sea level rise or much, much worse. And the far flung infrastructures that they rely on will all, increasingly, need more and more costly and involved protections before they too succumb to the rising tides. Sea Level Rise — Are Coastal Nuke Plants Ready? 12 Percent. That’s how much of Greenland’s surface experienced melt yesterday according to a report from DMI’s Polar Portal as an unprecedented flow of warm, wet air slammed into its great ice sheets. 10 Percent. That’s how much of Greenland’s ice sheet surface is required to melt in order to mark an official start to the Summer melt season. Late May or early June. That’s when Greenland melt season typically begins. In other words, a Greenland melt season that usually starts as May rolls into June and has never initiated before May 5th just began on April 11th of 2016. That’s 24 days ahead of the previous record set only six years ago and more than a month and a half ahead of the typical melt start. In other words — way too early. But in a rapidly heating world where monthly temperatures have now exceeded a range of 1.5 C above 1880s levels, we could well expect Greenland melts to begin earlier, end later, and encompass more and more of the ice sheet surface at peak melt during July. Today, temperatures for the whole of Greenland — a 1.7 million square kilometer island containing enough ice to raise sea levels by more than 20 feet should it all melt — were measuring as high as 10.17 C above average (more than 18 F above average) with readings over much of northern and central Greenland spiking over 20 C (36 F) above normal (1980-2010) ranges. So it’s likely that Monday’s record early 12 percent surface melt will extend and possibly expand on through today (April 12). Over the coming week, temperatures across Greenland are expected to steadily fall back toward more normal ranges. However, it’s worth noting that much of the heat from this year’s record early melt spike will be baked into the ice — adding a kind of internal heat pressure as Spring gradually progresses into Summer. 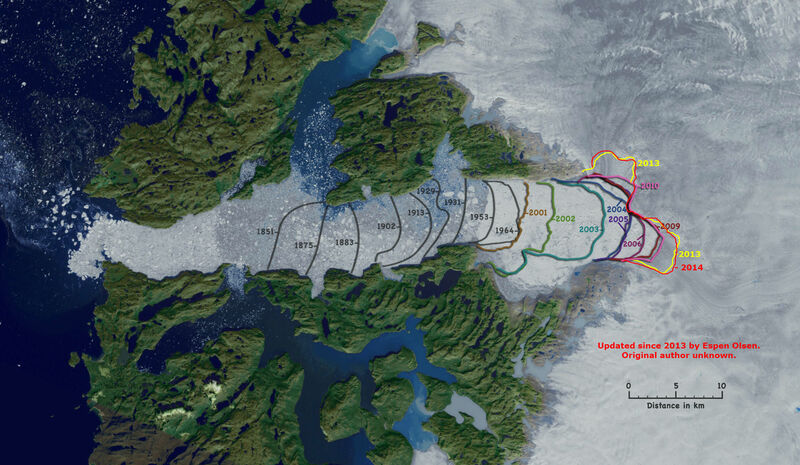 During July of 2012, an unprecedented 95 percent of Greenland’s surface experienced melt. For 2016, unprecedented Arctic warming during Winter appears to have set the stage for a serious challenge to both 2012 Greenland and 2012 Arctic sea ice melt records. And with seasonal sea ice at or near new record lows even as Greenland is off to an amazingly early melt start, it appears that 2016 is now in a race to set a number of new benchmarks as Arctic ice continues its ominous and disruptive longer-term decline. Reports from the UK Met Office are in. And we can say now with confidence that the UK have never seen weather like what they experienced this Winter. It looks like a storm track super-charged by climate change really socked it to the region this year. That we’ve just passed a winter worse than the then record years of 2013 and 2014 — only two years on. 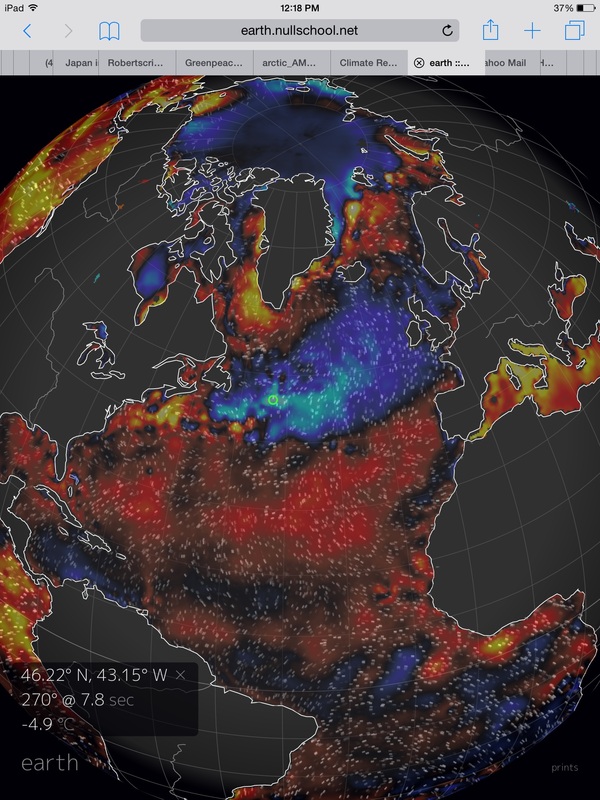 For the UK and for North Atlantic weather stability in general, the sea surface temperature anomaly signature in the graphic below is bad news. The cool pool just south of Greenland (indicated by the swatch of pale blue) is a new climate feature. One that appears to be related to glacial ice melt outflow from Greenland. Such melt outflow tends to slightly freshen sea surface waters. Freshening waters keep more heat locked into the ocean’s depths. They tend to cool the surface waters. And they slow down an ocean overturning circulation that, in the North Atlantic, drives the flow of the Gulf Stream. A slowing Gulf Stream delivers less heat to this zone even as it piles more heat up off the North American Coast. As a result, a warm west, cool east dipole tends to develop. In the cool region south of Greenland, unusually strong storms have developed more and more frequently — with a dramatic impact on UK weather. The storms feed on this temperature differential even as they have gorged on heat and moisture streaming northward in a meridional flow over Western Europe. The results this year were nothing short of record-shattering. For England and Wales, with temperatures ranging about 2 degrees Celsius above average for December, January and February, 2015-2016 probably beat out 2007 and 1989 as the hottest Winter on record. Meanwhile, Wales and Scotland saw the most rainfall ever recorded — with totals for both regions hitting around 756 millimeters or about two and one half feet. That’s even more rainfall than the previous record stormy Winter of 2013 and 2014. These heavy rains set off severe floods and damaged homes, roads, and bridges throughout the UK with the worst damage focusing in on regions to the North. One heavy precipitation hot spot — Argyll — saw an extraordinary 1035 mm or 3.5 feet of rainfall over the three month period. The Met Office is quick to point out that though December, January and February were the wettest on record since 1910, heavy rainfall events began in November — resulting in what amounts to a relentless four month pounding as storm followed storm and flood followed flood. And, it appears, this persistent and ongoing storm pattern has not yet changed. For the North Atlantic remains riled — setting up to hurl a new gale-force low at Ireland and the UK this week. With the weather pattern essentially stuck in stormy since November, folks from these regions have got to be asking — when’s it going to end? As storms continue to fire off in the dipole zone above, it appears it will likely last until at least mid-March. The evidence that a human-forced warming of the globe is hitting a much higher gear in terms of both added heat and ramping impacts just keeps streaming on in. Today, an update in the satellite monitor tracking global sea level rise provides yet one more ominous marker. The world’s oceans are rising at an unprecedented rate not seen since the end of the last Ice Age. A rate that appears to be rapidly accelerating. It’s a tough bit of evidence that the world is swiftly accumulating heat. For aside from atmospheric temperature readings, the rate of sea level rise is probably the best marker for how fast the world is warming. It’s a sign of heat build-up that’s thermally expanding the ocean. And, far more ominously, it’s a sign that the great glaciers of the world are starting to accumulate enough heat to go into a more and more widespread melt and destabilization. Ever since the Holocene climate era began about 10,000 years ago, ocean levels and shorelines have remained remarkably stable. 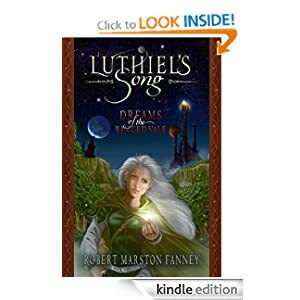 At the close of the 19th Century, and in conjunction with a build-up of heat-trapping gasses in the atmosphere through the extraction and burning of fossil fuels, sea levels began a rise that would start to mark a departure from the stable coastlines human civilizations had enjoyed for so long. At first the rise in global waters, driven by a then slow accumulation of heat in the world ocean system, was slight and gradual. Beginning in 1870, and continuing on through 1925, sea levels across the world increased by about 0.8 millimeters per year. The increase was likely driven by heat accumulating in the atmosphere and then transferring to the surface waters of the oceans. From 1870 through 1925, atmospheric carbon dioxide levels had increased from around 280 parts per million to 305 parts per million — into a range about 25 parts per million above the typical interglacial peak CO2 level of the last 2 million years. A volume of heat trapping gasses that began to slowly upset the Holocene’s relative stability. If scientists and researchers at the time were paying closer attention, they would have noted this mild but consistent increase in the height of global surface waters as the first hint that the human emission of greenhouse gasses was starting to alter the Earth environment. Sadly, it took many more decades to begin to understand the profound changes that were starting to take place. While climate science was still in its infancy during 1925, a human forced warming of the globe was starting to kick into higher gear. A signal of atmospheric warming since the 1880s was beginning to develop. Though unclear, it was becoming apparent that the airs of the world were building up heat. But the waters of the world were providing a strong signal that the Earth was accumulating that heat more and more rapidly. 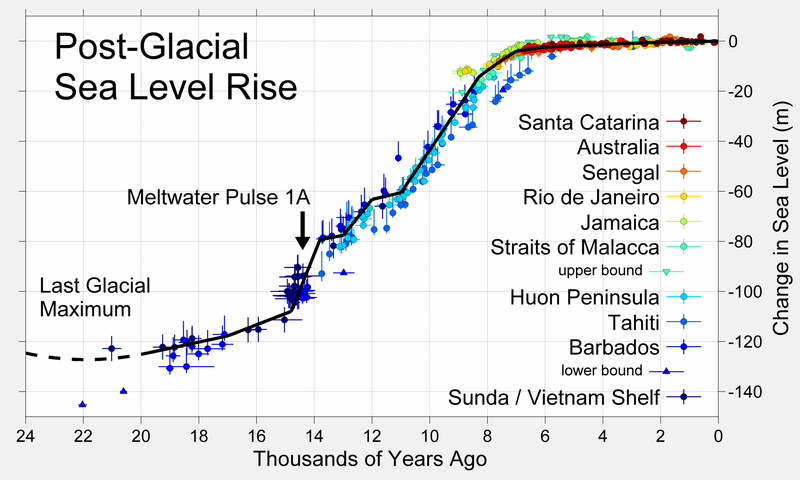 Sea level rise, at that time driven by thermal expansion and by a later small but growing contribution from glacial melt, took its first leap higher. And from 1925 through 1992, the average rate of sea level rise more than doubled to 1.9 millimeters per year. It was a sign that the Earth was warming more and more rapidly and that the heat was showing up in still more thermal expansion of the world’s waters. During the same period, atmospheric greenhouse gasses increased from 305 parts per million in 1925 to around 350 parts per million (entering the bottom range of the Pliocene 2-5 million years ago) by 1992. This jump by 45 parts per million in just 67 years pushed the Earth’s climate well outside the range of past interglacials — exceeding the previous peak of 280 parts per million CO2 by more than 70 parts per million overall. Atmospheric temperatures, by 1992, had also increased into a range about 0.5 C above 1880s values. We had started to enter a period where the context of the human-driven warming (primarily enforced by a monopolization of energy markets by fossil fuels) was being pushed far outside the range of the Holocene and into time periods tens of thousands to hundreds of thousands of years in the geological past. The Earth System, in other words, was entering a period of increasingly dangerous imbalance. During the 17 years from 1992 through 2009, atmospheric carbon dioxide levels rose by 40 parts per million to about 390 parts per million in total. That’s a rate of accumulation nearly four times faster than the entire period from 1925 through 1992. An accumulation that by 2009 had pushed the world into a climate context more similar to the warmest periods of the Pliocene of 2-5 million years ago, than of the geological epoch in which human civilization emerged and thrived. For the Holocene was then starting to look like some fond memory fading off into an increasingly murky and smoke-filled far horizon. 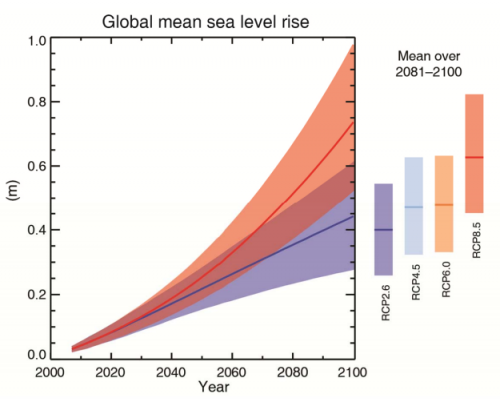 Rates of sea level rise again increased — hitting a ramp up to around 3 millimeters per year. More ominously, scientific studies were beginning to indicate that the Greenland Ice Sheet and West Antarctica were starting to significantly contribute to the rising waters. The great glaciers were showing their first signs of a mass seaward movement called a Heinrich Event. And with the world hitting 0.8 degrees Celsius above 1880s temperature values and rising, such an event was starting to look more and more likely. Now, by early 2016, with the world at 1.1 C warmer than 1880s averages and with CO2 levels likely to peak at around 407 parts per million this year, it appears that rates of sea level rise have again jumped markedly higher. For according to satellite altimetry data from AVISO, global sea levels rose by 36 millimeters from the end of 2009 through October of 2015. That’s an annual rate of around 5 millimeters per year and one far above the longer term range of 3.1 mm per year established from 1992 through 2012. We can clearly see the departure from the trend line starting post 2011 in the above graph. And if we were to cherry pick that particular departure zone, the rate from trough-to-peak would be 7 millimeters per year. However, since a La Nina occurred during 2011-2012 and a record strong El Nino is occurring now, that particular trend line is probably a bit exaggerated. The reason being that La Nina tends to dampen rates of sea level rise through variable cooling and El Nino tends to spike rates of sea level rise as world surface waters warm during such events. However, even when correcting for La Nina and El Nino variation, it appears that sea level rise since 2009 is tracking in a range of 4 to 5 millimeters each year — which is yet another significant departure from the trend. A rate that, if it were to further solidify, would be 5 to 6 times faster than initial rates of sea level rise at the start of the 20th Century or two and a half times faster than the sea level rise rates from 1925 through 1992. Spiking rates of heat accumulation and related thermal expansion of the world’s oceans is likely playing a part in the current increase. But, all-too-likely, the numerous destabilized glaciers now rushing seaward — which in total contain at least enough water to raise seas by 15-20 feet — are also starting to add greater and great contributions. And, unfortunately, with global temperatures now pushing into a very dangerous range between 1 and 2 degrees Celsius above 1880s averages, we are likely to see more and more of these glaciers go into a rapid seaward plunge. It looks like we’ve already locked in a ramping rate of sea level rise for decades to come and at least 15-20 feet long term. But that pales in comparison to what happens if we keep burning fossil fuels. Did a January Hurricane Just Set off a Massive Greenland Melt Event in Winter? This freakish Winter there’s something odd and ominous afoot. We’ve seen unprecedented above-freezing temperatures at the North Pole coincident with record low daily sea ice extents. We’ve seen global temperatures hitting new, very extreme record highs. We’ve seen climate change related storms raging across the globe — flooding both the UK and the Central US, firing off record hurricanes during January in both the Pacific and the Atlantic — even as other regions swelter under record heat and drought. Now, it appears that Greenland is also experiencing an unprecedented melt during wintertime. Greenland — the last bastion of major continental glacial ice in the Northern Hemisphere. An island archipelago dwarfed by great mountains of frozen water towering as high as two miles. Though the Arctic sea ice provides quite extensive coverage — in the range of millions of square miles — the great Greenland Ice Sheet contains the majority of the remaining frozen fresh water in the Northern Hemisphere. And though the extreme ongoing sea ice melt does not contribute to sea level rise, Greenland melt is another matter entirely. In total, if all of the Greenland Ice Sheet flooded into the world ocean, it would raise global sea levels by an average of 23 feet. Enough to inundate pretty much every coastal city in the world. And Greenland is melting, pushing those sea levels higher. Contributing hundreds of cubic kilometers of melt water into the world ocean system every year since at least the middle of the first decade of the 21st Century. Creating an ominous ocean heat-conveyer that spreads fresh, cool water out at the surface even as it pulls deep, warmer water directly in toward the many glaciers whose towering faces plunge into the ocean itself. During recent years, most of Greenland’s melt has occurred during the hot season of summer even as the ice sheet underwent re-freeze and a pseudo-recovery during Winter. Sure, net mass loss was in the range of hundreds of billions of tons each year. But we still had consistent and uninterrupted mass gain during Winter. Unfortunately, with human-forced warming there was always a danger that, during Wintertime, we’d see an increase in melt pressure as well. At issue is the way in which greenhouse gasses fundamentally warm the atmosphere and oceans. Possessing the ability to re-radiate solar energy, greenhouse gasses have a greater impact on temperatures during times of darkness and during Winter. In other words, we’d expect nighttime temperatures to warm faster than daytime temperatures and we’d expect wintertime temperatures to warm faster than summertime temperatures. Perhaps more ominously, the oceans are very efficient holders of heat and are less impacted by seasonal variance than the lands. In other words, if the world’s oceans warm, they re-radiate much more heat back to the atmosphere and ice sheet during Winter than they do during Summer. This kind of greenhouse gas warming is an assault on the winter season itself. It’s something we’ve seen in the frequent extreme polar warming episodes during recent years. One that this year generated a very odd and ominous period of above-freezing temperatures at the North Pole. But if there’s something even more odd than temperatures at the North Pole hitting above freezing during Winter, it’s an incident of substantial melt occurring over the Greenland ice sheets during what should be the coldest, darkest season. Over the past few days, just such a major heat-up has been underway across a large section of Western Greenland. Warm winds flowing off the North Atlantic — driven by hurricane Alex’s merging with powerful lows south of Greenland — have roared up over the southern coastal ranges. Meanwhile, warm, tropical air has infiltrated northward over Baffin Bay. The net result is temperatures approaching 20-40 degrees Fahrenheit above average (16 to 22 C above average) over a broad region of Western Greenland. Over the past few days, as indicated in this recent post by Jason Box, the region near Disko and Uummannaq Bays — both in Baffin Bay and along the coastal ranges — has felt the full force of this substantial warm-up. By today, a large section of the coastal offshore waters and a wedge of glacier-covered Western Greenland all experienced near or above-freezing temperatures. A very rare event for Greenland and Baffin Bay during wintertime and one that appears to have coincided with a possible large glacial melt water outflow from the Jackobshavn Glacier. Spot temperature readings along the southern reaches of the Jacobshavn Glacier hit 1 C or 34 F today according to GFS measures. Meanwhile near freezing temperatures have dominated Niaqornat on Uummannaq Bay (forecast to hit 32 F on Tuesday). Ilulissat on Disko Bay is showing 36 F temperatures at 12:00 AM Monday and is forecast to hit 41 F on Tuesday, even as Nuuk (about 200 miles south of Ilulissat) is showing 40 F temperatures at 12:00 AM Monday. These are all extremely warm readings for Greenland during Winter. Disko and Uummannaq Bays are notable in that they are the outflow zone of the Jackobshavn Glacier — one of the swiftest-melting glaciers on Greenland. 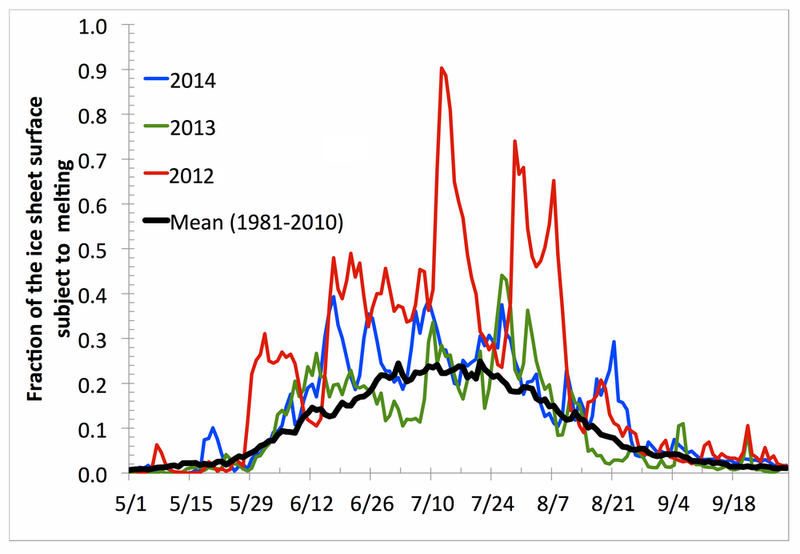 Over recent years, it has been one of the primary hot-spots for summer Greenland ice mass loss. But during recent days, mass loss also appears to have occurred in this area. Dr Jason Box notes that surface mass balance totals have consistently shown up as negative over the past week in the DMI measure. A record that continued today. Though Dr. Box states that such a negative mass balance could simply be chalked up to wintertime sublimation, the consistent losses showing up in the monitor over the past seven days have coincided temperatures in a melt-inducing range. In addition, Dr Box also indicates a disturbing flushing of ice away from both Disko and Uummannaq Bays occurring on January 16th. In the satellite shot, both sea ice and ice burgs are moved en-mass from the bays and on out into the waters of Baffin. Large Melt Water Pulse From Jacobshavn? Offshore winds could be the cause. But, again, the ice movement coincides with indications of mass loss over Greenland’s Western glaciers as well as a period of much warmer than normal, above-freezing temperatures. 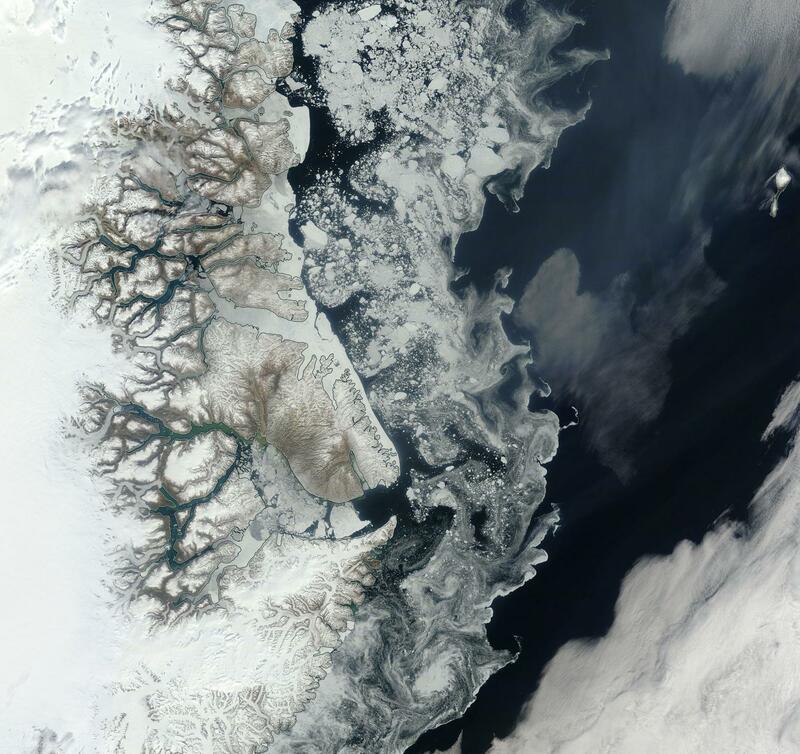 Perhaps more ominously, this widespread clearing of ice from these Arctic bays occurs in concert with what appears to be a large ice-calving event along the ocean-facing front of the Jacobshavn Glacier. In the above graphic by Dr. Jason Box (see more here), we see a large retreat of the glacier together with what looks like a major sediment outflow. Sediment hitting water in this way would be a sign that a very large volume of water had been expelled along the basal zones of the Jacobshavn. In addition, the ice itself appears to have been forcibly ejected. This apparent sediment flush, the concave bowing of sea ice away from Disko and Uummannaq and the inland recession of the calving face are all indicators that something terrible is afoot in Western Greenland. A large flush of melt water coming from Greenland during Winter would, indeed, be that terrible thing. 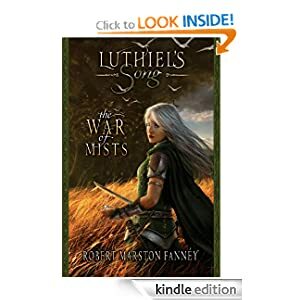 Something that now may become a more and more common feature of our age as Winter continues its ongoing retreat against a relentless assault by human greenhouse gas emissions. Arctic Sea Ice Prepping For New Record Lows in 2016-2017? 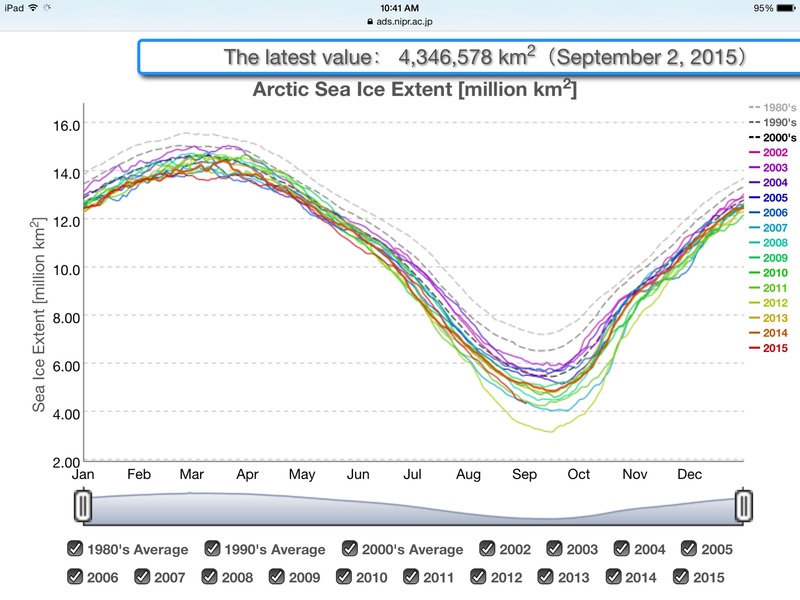 It’s been a pretty rough Summer for Arctic sea ice. Rougher than one would expect when considering how rapidly Greenland is melting and given that the Gulf Stream appears to be slowing down. Increased rates of Greenland melt, increased fresh water outflow from rivers into the Arctic Ocean, and increases in ice berg calving have provided more fresh water to the Arctic Ocean (which would tend to cool the ocean surface) and weakened the south-to-north heat transfer of the Gulf Stream. Under such conditions, we’d tend to expect more than a little rebound in Arctic sea ice coverage. What we instead saw was a brief bump in the sea ice area, extent and volume measures during 2013 and 2014. As of September 2nd, less than two weeks shy of traditional melt season end, sea ice extent in the JAXA measure had hit second lowest on record (please also see Neven’s most recent comprehensive sea ice report for his take on near end season ice states). It’s a trend well below the 2014 pseudo-recovery year. One that is now tracking just beyond the previously record-smashing 2007 trend line. The measure of 4.346 million square kilometers is about 60,000 square kilometers below 2007. And though still quite a bit higher than 2012, it’s a swing that pushes toward a somewhat unsettling reassertion of the long-term melt trend. A trend that since the 1970s has reduced late season sea ice coverage by nearly half. Other measures, though slightly less pronounced than the JAXA monitor, also show significant departures below the pseudo-recovery years 2014 and 2013. The NSIDC extent measure places the 2015 melt season as roughly tied with 2007 as second lowest on record and a 4.586 million square kilometer coverage. Meanwhile, sea ice area is tracking the 2010 melt line at 6th lowest on record for the date at 3.322 million square kilometers — a substantial 370,000 (approximate) square kilometers below 2014 — in the Cryosphere Today measure. Conditions in Context — Preparation for Another Record-Breaker in 2016 and 2017? Given recent science and observations showing increased rates of Greenland melt, increased fresh water flows into the Arctic Ocean, and a slowdown of the Gulf Stream, North Atlantic Overturning Circulation, and a related development of a cool pool between Greenland and England, we should probably assume that the Arctic is now involved in a climate change feedback tug of war. On the one hand you have rising atmospheric greenhouse gas levels in the Arctic due to a combination of human emissions and a growing carbon feedback response from permafrost and seabed stores. This heat-trapping atmospheric witch’s brew couples with loss of sea and land ice albedo to push for a continued rapid Arctic warming. On the other hand, you have fresh water outflows interrupting some of the south-to-north heat transfer in the North Atlantic and keeping a lid on some of the ocean heat in the High Arctic and near Greenland. Adding to this volatile mix is a potentially record-shattering El Nino which will, over the course of the next two years generate an ocean and atmospheric heat pulse that will probably maximize in the Arctic come 2017. Since 2015 is seeing returns to sea ice area and extent values in the range of 2010, 2011, 2008 and previous record low year 2007, there appears to be a preparation for the Arctic to challenge 2012 record low values over the 2016-2017 time period. And if sea ice does hit new record low values during that period of heightened risk we can also expect the whip-lash melt response from Greenland to grow even stronger. They say that a picture can paint a thousand words. How about a graph that exceeds 100 El Ninos? It may not jump out at you at first, but that’s what we’re looking at above. This graph, provided by Weather Channel Affiliate WSI (and based on atmospheric data collected by NOAA) represents intensity of atmospheric response patterns to El Nino. Typically, this means cloudiness at the Central Pacific Equator, the propagation of near equatorial westerlies, atmospheric wave propagation in the Jet Stream, and storm track amplification. In other words, teleconnections. On the left side of the above graph, we see positive and negative numbers indicating standard deviation correlation to an ENSO neutral state. Push into 2 standard deviation range either high or low and you’re getting about a typical El Nino or La Nina response from the atmosphere. And ever since June we’ve been in the 3 standard deviation or about top 10 percent of El Nino response range. That’s a pretty strong ocean to atmosphere signal. But it pales in comparison to what’s being predicted. Looking ahead, the Euro weather model then pushes us all the way up to a 4 standard deviation event (or top 1 percent of atmospheric response rates) by early-to-middle August. This is an extreme response to El Nino. One that could have some amazing impacts come Fall, or possibly sooner (see North Atlantic storm discussion below), especially when we take into account some of the added impacts of human caused climate change. Should such a response emerge, both the US Southeast and Gulf Coast could be in for some extremely severe storms. For the US, such a strong atmospheric response to El Nino forcings would tend to indicate a powerful trough digging in through the Eastern half of the country, even during summertime. And while we do see a rather strong trough for this time of year setting up over and extending down from the Hudson Bay region of Canada, we do not see an overall suppression of summer-time heat and potential for greatly increased precipitation that would typically occur under such a pattern, as yet. Instead and somewhat oddly, the pattern has kicked energy out over the ocean — fueling the North Atlantic storm track and powerful oceanic cold core cyclones at a time when such events should be rare. Yesterday, a gale hammered Scotland and Ireland, kicking up seas west of England into a frenzy of 30 foot swells. To say this event is odd for summertime is a bit of an understatement. Sans tropical storms swinging north, the higher Latitude regions of the Atlantic are typically calm this time of year. But living in typical times we are not. Greenland melt is ramping up. 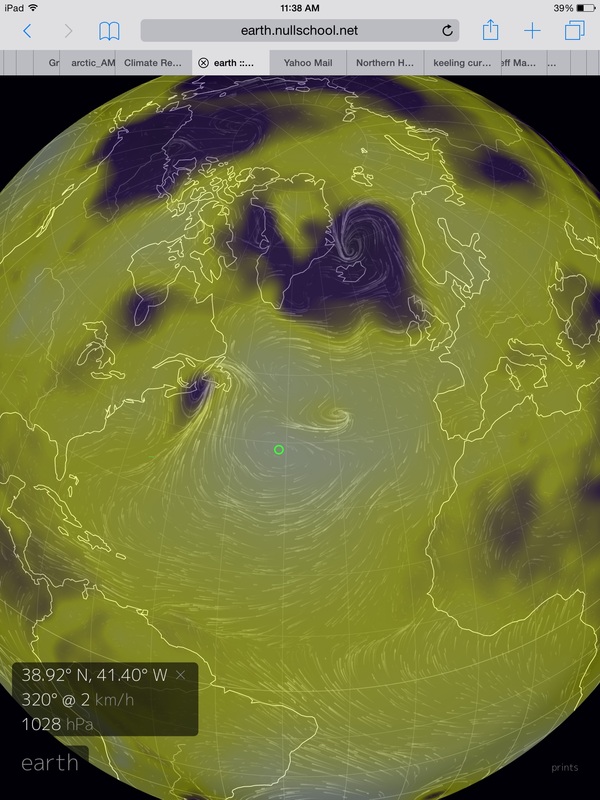 And so we see the start of a Heinrich Event-like cool pool in the North Atlantic. Call it a baby Heinrich or a precursor or whatever you like. But it’s there. And it’s anomalously cool. And it’s going to influence the weather regardless of whether we like it or not. It’s an event related to both fresh water flow into the North Atlantic and an associated decline in the strength of the Gulf Stream. 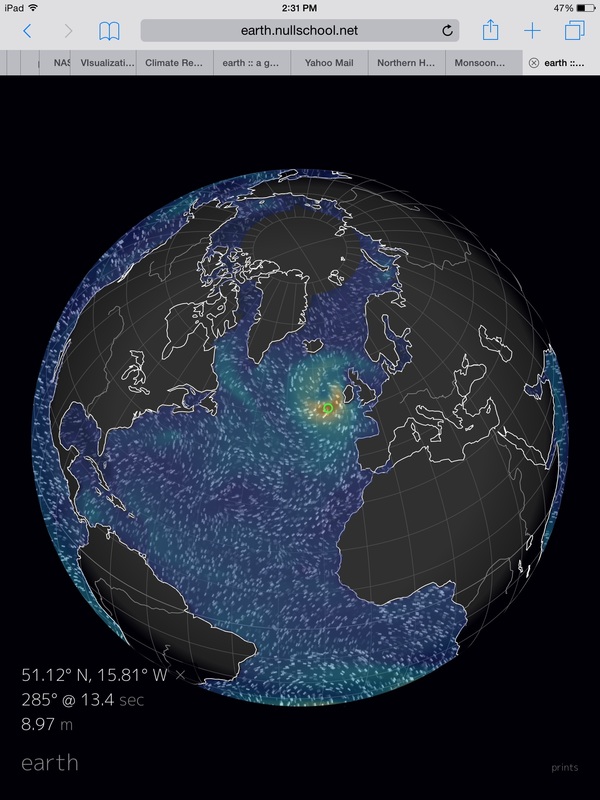 This odd summer North Atlantic storm generation is then, perhaps, due to a teleconnection between the strong atmospheric signal of El Nino and the underlying signal of human-forced climate change. Such a teleconnection would tend to shift the El Nino related trough a bit eastward and result in an amplified North Atlantic storm track. Which is exactly what we are seeing. NOAA long range forecasts are also picking up the signal of powerful storm track intensification over the Gulf Coast and the Southeastern US. Such a prediction hints at a strong storm track running diagonally across the Atlantic from Florida to England and aligned with a trough edge running through that broader region. 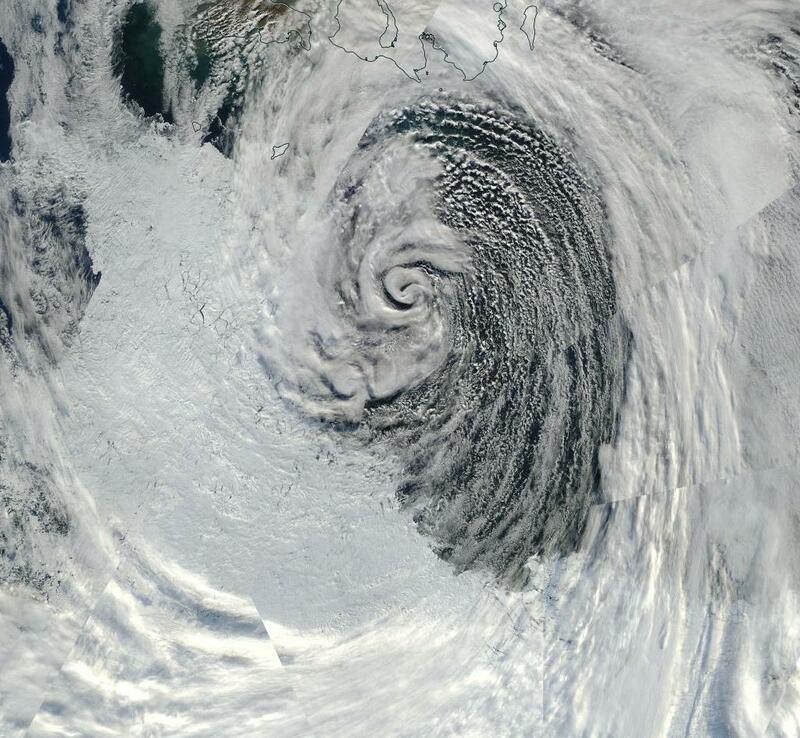 It’s a pattern that could put England in the firing line for severe winter storms yet again. For the US, the upshot is powerful storms slamming a region from Texas through the Carolinas from September through February. Florida, Coastal Georgia and the U.S. Gulf Coast are particularly hard-hit in the forecast. But we also shouldn’t rule out some strong bombs impacting the Mid-Atlantic region before they tear off across the ocean. No Significant Drought Relief for California? Sadly, the atmospheric response to El Nino is not pushing forecasts for a wet winter for the US West Coast. Monsoonal moisture hits the US Southwest during September and October, but barely touches California in the forecast. The moisture pattern then retreats eastward. Heat and dryness are particularly focused in the region of Washington, Oregon, Idaho and Montana. Abnormal warmth is also predicted to remain in place over Alaska. This pattern appears to indicate that the NOAA models are calling for the Ridiculously Resilient Ridge and the hot Blob of water off the US West Coast to mostly remain in place. An overall very bad forecast considering El Nino’s predicted intensity and the currently indicated strength of atmospheric response. It may be that cooling in the North Atlantic associated with Greenland melt and Gulf Stream weakening is having such a powerful impact on the Jet Stream that El Nino cannot over-ride — instead solidifying the Pacific Ridge to Atlantic Trough fixed atmospheric wave and dumping its teleconnection influence into the firing range that the North Atlantic is steadily morphing into. To this point, it’s worth noting that long range model forecasts of this kind can carry with them a rather high error bar. The ocean-atmosphere forcing of the predicted super El Nino will likely result in some rather dramatic wrenchings of the climate system. And for such an El Nino to fail to over-ride the West Coast block would have some very serious added impacts on down the line. It’s an El Nino year. It’s a year in which global CO2 averages are hitting above 400 parts per million for the first time in at least 3 million years. And it’s a year in which CO2 equivalent values for all greenhouse gasses (including methane, nitrogen compounds and other exotic heat trapping gasses) that humans have emitted are nearing 485 parts per million. Added together — the equatorial Pacific Ocean taking a break in its duties as atmospheric heat sink (El Nino) combined with the immense volume of heat trapping gasses human beings have now loaded into the atmosphere — it’s more than enough to force global temperatures into territory likely not seen since the Eemian interglacial period 150,000 years ago. 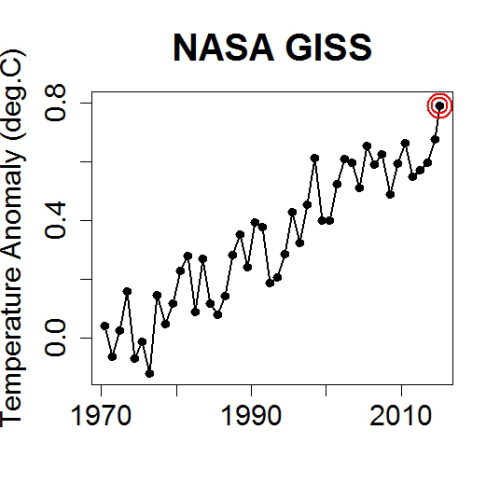 And NASA GISS, in its monthly report, is showing global temperatures that are edging into the Eemian range. First, April of 2015 came in at 0.75 Celsius (C) hotter than NASA’s global 20th Century benchmark (0.95 C hotter than 1880). This represents the second hottest value for April on record in the entire 135 year climate record, coming in just a bit cooler than the 0.83 C departure for 2010. Meanwhile, hindsight adjustments have found that the January-through-March period was warmer than earlier indicated — with new departures hitting +0.76 (Jan), +0.80 (Feb), and +0.85 (Mar). Combined, the average of these first four months is +0.79 C above 20th Century measures. Or about +0.99 C above 1880s values. This puts us well outside the context of the 10,000 year period beginning at the end of the last ice age (Holocene) and edges us into a range more typical to the Eemian. A time when sea levels were between 6 and 8 meters (20-25 feet) higher than today. Here we find that polar amplification for the upper Northern Hemisphere latitudes was continuing to hit high marks. 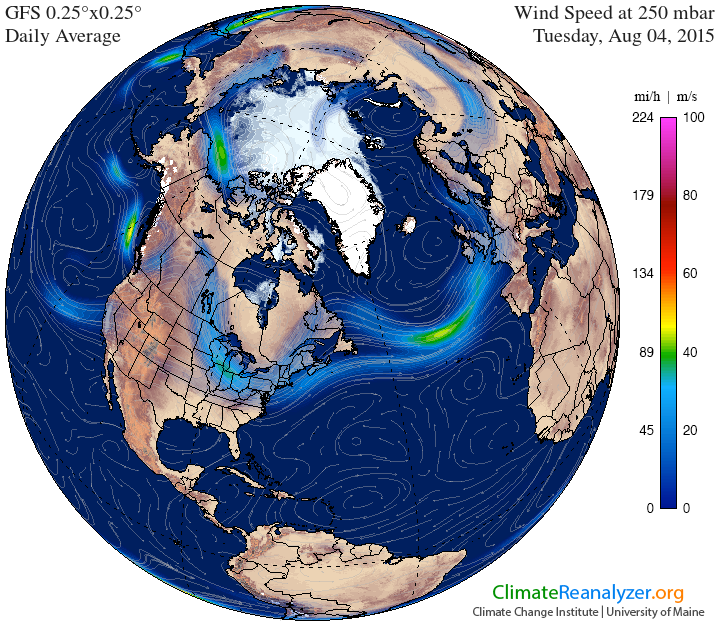 Broad south-to-north wind flows over central Asia drove a powerful warming spanning up from Lake Baikal in Russia, on through Central Siberia, up over the Yamal region and into the High Arctic. Average temperatures for the month in this zone ranged from 2 C to as high as 6.9 C above average. Another zone of extreme warmth sprawled out over Western North America and into the Beaufort and Chukchi Sea regions. There, temperatures ranged between 1-4 C above 20th Century averages. Other notable warm regions included the Equatorial Pacific — showing a band of 1-2 C departures in association with a developing El Nino — and the West Antarctic Peninsula, which saw heating in the range of 2-4 degrees Celsius above average for most of the month. Overall, most of the globe showed above average readings with cool pools relegated to isolated regions. In particular, the distribution of cool temperatures near Greenland is somewhat disturbing. It’s an indication of increased glacial melt outflows from Greenland ice sheets into the North Atlantic. It’s also a validation of climate model analysis of human-caused global warming — which indicated cooling near Greenland due to a combination of ice sheet and ocean responses to heating the Earth-Ocean System. The ocean response — a dangerous slowing of Atlantic thermo-haline circulation — was also identified in a recent paper by Rahmstorf. NASA zonal anomalies also continue to validate climate model predictions for human-caused warming. Here we find the predicted extreme polar amplification — more rapid warming of the Northern Hemisphere polar zone than the rest of the world — clearly indicated. There, in the 60-90 North Latitude zone we find temperatures ranging from 1-3.5 Celsius above the 20th Century global average. A rate of warming far exceeding any other region. All other Latitudinal zones show about a +0.75 C above average temperature departure. The first noted exception is the heat sink in the Southern Ocean (at -0.5 to +0.5 C in this measure) which continues to uptake atmospheric heat, transfer it to the middle ocean and, by Ekman pumping through storm action, deliver it exactly where it is least needed — along the basal regions of various melting Antarctic ice shelves. The second is marked by a zone of March-April storm intensification along the Antarctic Continent and Southern Ocean boundary centering at 75 degrees South (-0.5 to -1 C). Overall, temperatures at +0.99 degrees Celsius above 1880s averages for the first four months of 2015 should be cause for concern. We still have El Nino ramping up in the Pacific. And with some models showing the event could be quite powerful, the added boost to global heating we are seeing now could well ramp higher later this year. In addition, we are entering an Arctic melt season that is showing some risk of pushing Arctic sea ice into new record lows — at least early in the melt season. Such an event would further tilt the globe toward record heat by reducing ice-based light and heat reflectivity in the Arctic at times of 24 hour sunlight (May through July). As such, there is risk that already record warming seen since 2014 and into 2015 could continue and, potentially, ramp higher through the end of this year.